Dark Redﾠ Rose Petals consisting of 500 grams are ideal forﾠ Wedding Flower Decoration, great for weddings party, Celebration, bridal, engagement, marriage proposal, Special festival decorations such as Valentines Day, Wedding anniversary, Birthdays, Candlelightﾠ Dinner, Classic Candy Buffets, Dessert Tables and more. 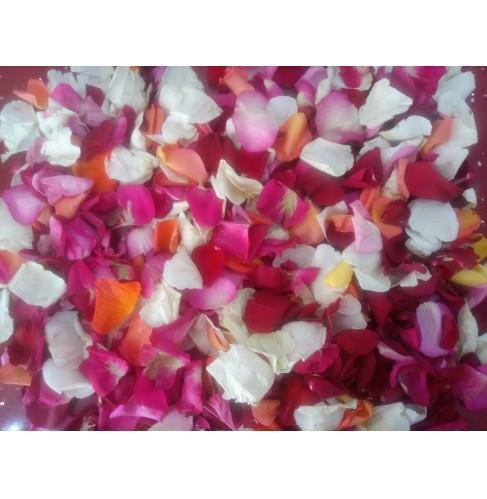 Sprinkle these petals over floor, bed, table, along with the aisle at a wedding (including proposal party, dating place, romantic birthday party, or honeymoons and Thanksgiving craft, etc) shower newly married couple with the flower petals. Moreover, you can also confess yourself with loved ones via these petal making into a heart shape.